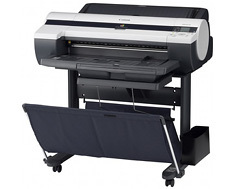 The Canon imagePROGRAF iPF610, introduced in early 2009, is a 24" large format color inkjet printer designed to produce large-size prints across many media types with a high initial cost and long-term upkeep requirements. The iPF610 measures 38.9" by 39.3" by 39" and weighs 149.9 lbs with the included stand. This makes it much too large to sit on a desk alongside other equipment, necessitating that the printer be placed on its own table or on a credenza to sit comfortably. The printer produces documents at a maximum resolution of 2400 dpi by 1200 dpi, consistent with most other wide-format models by other manufacturers. The printer includes borderless printing functionality. It supports printing to documents as large as Roll A1 or to custom media sizes of 24". Supported media sizes are B3, Roll, Roll A3, A2, Roll A1, A3, Roll A2, B4, and A4, and the printer supports printing to heavy-weight glossy photo paper, heavy-weight semiglossy paper, proofing paper, semi-gloss photo paper, self-adhesive synthetic paper, coated paper, heavy-weight coated paper, matte photo paper, high resolution paper, plain paper, glossy paper, synthetic paper, glossy photo paper, matte paper, translucent film, and tracing paper. It can print to media between .07 to .8mm thick through its top loading manual feed, between .5 and 1.5mm through its front loading manual feed, between .08 and .8mm through the roll feed, and .08 and .3 through the cassette. Its maximum roll print length is 59 feet and its maximum media roll diameter is 5.9 inches. The printer includes a USB 2.0 port and a 10/100-Base TX Ethernet port for connectivity, including a built-in print server to allow the printer to be easily networked. Included drivers support Windows versions from Windows 2000 onward, as well as both Mac OS 9 and Mac OS X. The printer also includes 256 MB of RAM. The printer can be fed paper through a roll feed, which can take one roll at a time. The top loading manual feed and front loading manual feed also both can take one sheet at a time. The printer also includes a cassette designed to process up to 250 sheets of letter or plain paper. When idle, the printer emits 35 dBA of noise, and 52 dBA when operating. The printer has a 5-ink palette and uses Canon FINE (Full-lithography inkjet Nozzle Engineering) to produce prints. Its minimum ink droplet size is 4 picoliters and it contains 5 individual ink tanks. A status LCD is built into the printer in order to allow users to check on and perform maintenance without requiring access to a PC. The printer has no options for expansion or further connectivity. Additional ports other than IEEE 1394 Firewire can not be added, nor are there any additional paper finishing options available, though this is consistent with printers like this one, which serve a single purpose -- large format image printing -- and are not suited for tasks like office-level paper throughput. 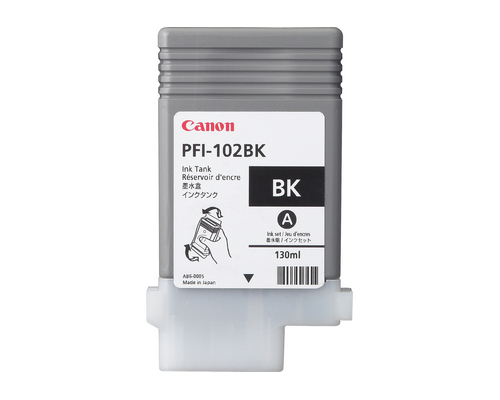 The printer uses GARO, Canon's proprietary print language, as well as HP-GL/2 and HP-RTL, which may make printing from certain applications, like ones that predominantly function from within DOS, difficult, as it lacks support for Adobe PostScript. Printhead cleaning is a difficult process and often requires the purchase of new printheads instead, adding to the long-term maintenance costs built into this unit. Review it: "Canon imagePROGRAF iPF610 "
Like other high-end inkjet printers, the amount of ink that this printer consumes varies based on the frequency of colors used and the quality of prints. As a consequence, ink is solely measured in milliliters, and all cartridges -- magenta, matte black, black, yellow, and cyan -- are rated at 130 ml of ink. Print heads and the maintenance cartridge also require replacement over time. Unlike some other models, this printer's black and matte black do not have to be swapped whenever alternating between matte and glossy prints, or between photo and non-photo prints, a convenience not necessarily made available on other printers like this one.